The Technical Assistance Center on Social Emotional Interventions for Young Children (TACSEI) has some very useful resources for parents. Positive Solutions for Families provides eight useful tips for parents of young children with challenging behavior. This resource is also available in Spanish. The Backpack Connection Series was created by TACSEI to provide a way for teachers and parents/caregivers to work together to help young children develop social emotional skills and reduce challenging behavior. Making Life Easier series is designed specifically for parents and caregivers. This series of tipsheets contains valuable information on how to make often challenging events easier to navigate, and even enjoyable, for both caregivers and children. Family Tools are a series of resources designed to support families around specific social-emotional learning tasks: identifying and expressing emotions, teaching children about feelings, responding to your child’s bite, etc. 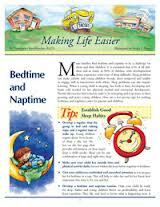 Each article outlines a focus, what to expect from children, and provides simple strategies to try. Tell Me What To Do Instead was created by Nevada PEP to provide guidance to families around positive descriptive acknowledgement of positive behaviors. This handout is two-sided in English and in Spanish. It is also available in Chinese. Several of these resources are also translated into Spanish. Click here for resources in languages other than English.